Our Detroit location provides a useful laboratory for the study of urban librarianship. 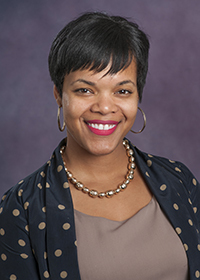 Dr. Kafi Kumasi's research interests revolve around issues of literacy, equity and diversity, particularly in urban educational environments spanning K-12 and graduate school contexts. A Laura Bush 21st century scholar, she holds a Ph.D. from Indiana University, Bloomington and a master's degree in LIS from Wayne State. Kumasi's publications include book chapters and journal articles in publications such as the Journal of Education for Library and Information Science, The Journal of Research on Libraries and Young Adults, School Libraries Worldwide, School Library Media Research, and Urban Library Journal. Kumasi said the cliche and erroneous statement that libraries provide equal access to all was a catalyst for her interest in urban libraries. "As an ideal, libraries are one of the few remaining public institutions that work to uphold that principle in theory and in practice," she said. "When I travel to various urban cities across the nation, I make sure to visit the main/central branch of the public library to see how well libraries are living up to their creed of access to all and freedom of information." Kumasi said her "tank was filled" when she recently visited the Enoch Pratt Free Library in Baltimore. "To see Black fathers reading to/with their young children in the children's section at Pratt and to see people who appear to be from all racial/ethnic and socio-economic backgrounds utilizing the public library on a Saturday afternoon provided some of the anecdotal data I needed to continue to advocate for public and school libraries," she said. Regarding Detroit's much-publicized revitalization efforts, Kumasi said she believes that a city is only as good as how well its public schools and public libraries function and are supported. "The commercial revitalization of downtown Detroit provides a great opportunity for library stakeholders, investors and community members alike to imagine a new and innovative space and library programming that will attract people from all walks of life," she said. "Unless and until our most vital public institutions such as schools and libraries are given the right amount of attention and resources, Detroit's revitalization will be incomplete. It will benefit a select few, but could have the potential to embody the library creed of access to all."